This poem was inspired by a painting from my friend Leslie White at Lesliepaints. You can see the painting here. This entry was posted in Poetry and tagged boat, Boats, letting go, Life, love, Mother ocean, nature, new beginnings, ocean, Painting, poems, Poetry, sailing, seasons, sun, Time. Bookmark the permalink. This is a lovely. You know? 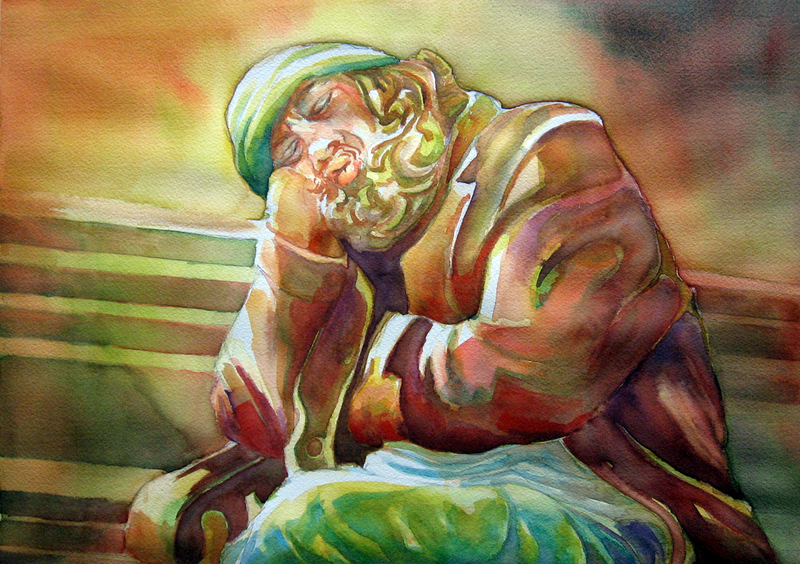 I envisioned him as a fisherman so that is really cool because many viewed him as homeless. I also like it that he is having a conversation with the birds. Thanks! Maybe it’s the time I spent on the ocean while in the Coast Guard, but he really looks like a fisherman / sea going type to me. Thanks for another inspiring painting! Hey there Stephen – let me know on my blog where you want me to send Officer’s Quarters to! I’m glad you’ve taken the time to look through more of these painting inspired poems. Basically, I go to Leslie’s site and look at the paintings. Typically, I get a feeling at first glance that there’s a poem for the painting. I’m sure that in many ways, the painting touches something from my past that wants expressing. In this case, I spent four years in the Coast Guard. There’s something in this photo that says “seafarer” and that grabbed me. If you keep exploring, I think you’ll find more in my writing than just waiting for someone :).